It’s easy to engage your child in doing and learning science. Here’s how. Children are natural-born scientists. 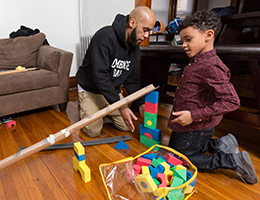 Every time they play with water, build with blocks, or ask “what,” “how,” or “why,” they are trying to make sense of their surroundings—the foundation of science learning. But a new study from EDC has found that only half of all families routinely incorporate informal science activities into their daily life. But it’s not for lack of interest: 7 out of 10 parents reported that they would do more science with their young children if they knew what to do. Here are four easy things that every parent can do to nurture children’s interest in the world around them. Young children love making a mess. Parents need only a couple of materials to turn mess-making into fun and collaborative science exploration. 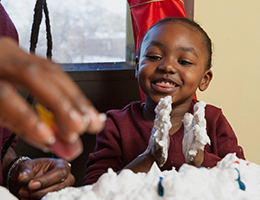 For young kids, spray a heap of foamy shaving cream onto a metal cookie sheet and encourage your child to touch, shape, and play with the substance. Ask “What does the shaving cream feel like?” and “What kind of shapes can you make out of it?” For more fun, add food coloring and observe how it travels throughout the shaving cream. Add more colors. Then mix it up! Older children may enjoy making “slime” (here’s one simple recipe). There’s a lot of science embedded in this project: children have to measure and mix ingredients, and parents can ask questions about the properties of this unique substance. What makes it so “slimy?” What are some ways to make the substance either more or less gooey? You can do a lot of engaging science activities with a sink, some plastic bottles, and a few toys. For starters, fill up the sink and then examine which objects float—and which fall to the bottom. Ask your child to share their ideas about why these objects float or sink, and then carry out some follow-up explorations to test their ideas. 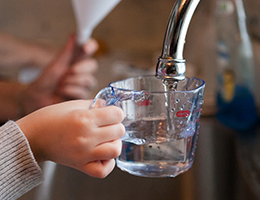 Or have your child fill containers of different sizes and shapes, and encourage them to describe how the shape of the water changes when they pour it from one container to another. Ready for more? Poke a few holes along one side of a plastic bottle (an empty 1-liter soda bottle works great) and then fill it up with water. Now turn the bottle upright, and observe how the water pours out of the different holes. Ask: What do you see? What happens to the streams as the water level in the bottle gets lower and lower? Structural engineering is science too, and explorations of motion and gravity can be fun for everyone. Here’s a simple activity: use LEGOs, cardboard, or even discarded recyclables to build a ramp, and then roll a marble down it. Work with your child to figure out how to make the marble go slower or faster. Or build two ramps and have a race! For an added challenge, see if you can get the marble to come to rest in a small container (such as a tin can or a small box) at the end of its journey down the ramp. What modifications do you have to make to the ramp to better control the path and speed of the marble? Finally, consider using a cell phone to film some of these trials. Watching these quick videos with your child offers more opportunities for scientific conversation and may even prompt new questions about the exploration. 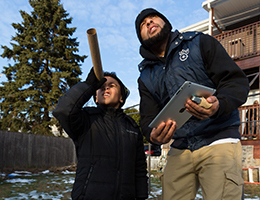 You can still do a lot of science even if you don’t have any materials available—just look up, down, or around. For example, when you’re outside, ask your child to look up and describe how the clouds are moving or why they think the swing keeps swinging after it is pushed. Or turn over some rocks at the base of a tree and talk about what you find. Need more ideas? Look to public media. The PBS KIDS programs Curious George, Ruff Ruffman, and Ready, Jet, Go all pose interesting, age-appropriate questions for young scientists to explore. Try watching one of these programs with your child, and then use the programs’ digital apps and offline activities to keep these explorations going. No matter what the science experiment is, the most important thing is to let your child take the lead, says Hoisington.